As the end of school approaches, I continue to set up experiences to engage my kids’ learning activities and to help launch them into summer motivated to continue learning. This is a tricky proposition with my students, as most of them come from disadvantaged backgrounds where Science Camp is not likely on the agenda. But my students are eager and are often looking for opportunities to connect with learning. One way I am doing this is by helping them make social connections on ScootPad. Being the GT teacher, I work with students in various classes across the grades, and not all the students are in the group across the year. Thus, many of my students are not physically in the room together at the same time, even though a number know one another or are friends. 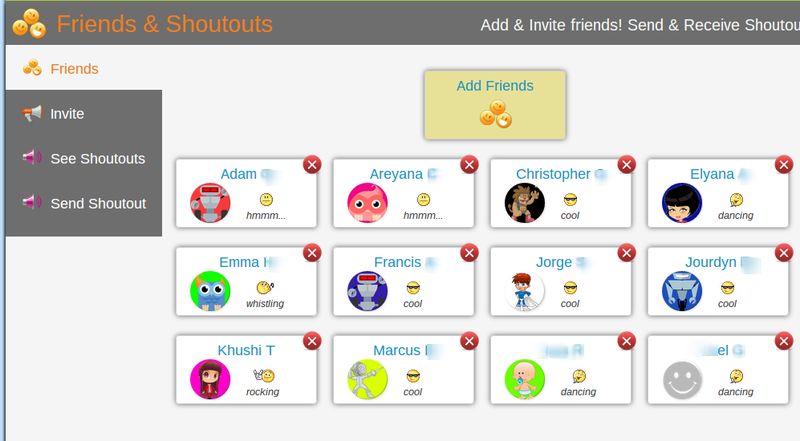 So to help make connections and get some conversations going, I invited them to extend their circle of friends on ScootPad. Hearing how students select their friends gives me valuable social information. Kids had a blast doing this, and it was equally useful for me. I got to listen to how they decided who to be friends with, and why. As a teacher, especially of GT students, it’s important for me to understand the connections my students are making to one another and how I might help foster that in class. Are there ways you have discovered emotional understanding through ScootPad?